Spotte is a bastion for Contemporary Art in the digital age. A unique internet-based art platform offering curated online exhibitions by coveted emerging and established artists. Dedicated to providing refined art and design collections to tastemakers all over the world, our artists create or assign a group of pieces fashioned exclusively for Spotte. These boutique collections are carefully selected and curated to satisfy any palate. We constantly expand our mediums and genres, from traditional media to avant-garde installations. Artists’ collections are presented in seasonal volumes. Four editions per year allow us to stay true to our mission of exclusivity and integrity, providing vibrant art pieces at your fingertips. Spotte is a pioneer of independent internet-based art boutiques, in a time when only colossal galleries, auction houses, and art museums are reacting to changes of digital age. With each new art exhibition, the site keeps growing and transforming. To this day, Spotte has been a 100% women-owned and operated platform. It was founded by Argentinean entrepreneur and arts veteran, Nelba Delmedico. 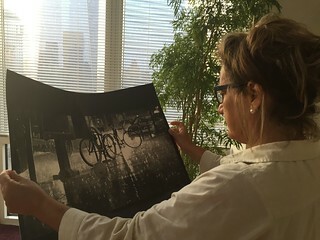 Nelba’s career in the contemporary art world spans more than 25 years. By carefully observing its changes, tech advancements and adopting a democratic approach to arts accessibility, she launched SpotteArt in late 2013 in an effort to create a digital art enterprise with positive social and cultural impact. SpotteArt was founded on a premise that quality art and design doesn’t have to require outrageous price points. In addition to representing platform's database of contemporary artists, Nelba also assists in a secondary market acquisition of modern and post-war masters. We have been working with individual collectors, art consultants and interior designers who follow our collections online. Our collaboration with the Hospitality industry has become our most recent focus of business expansion. We have been working with architects, designers and other interdisciplinary teams on a range of interior projects ever since. Our Services for Interior Designers could be found here.